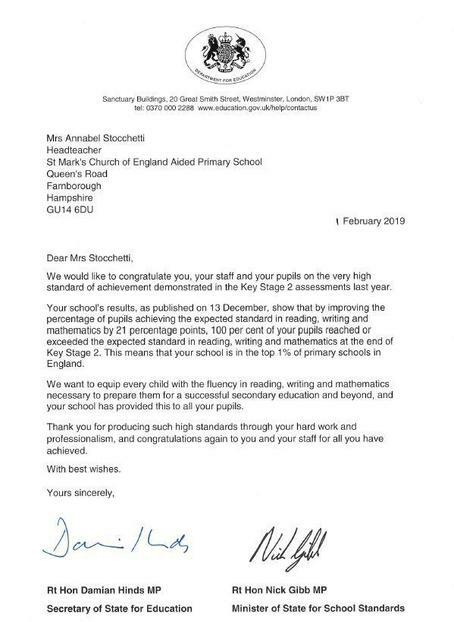 Following our school results as published in December, we have received a letter of congratulations to our school, from Rt Hon Damian Hinds MP and Rt Hon Nick Gibb MP. The results of the Key Stage 2 assessments last year show that 100% of the children in our school reached or exceeded the expected standard in reading, writing and mathematics, putting St Mark's CE Primary School in the top 1% of primary schools in England. We are extremely proud to receive this and highlights the hard work and professionalism of the team.